In this issue of ShowCase Magazine we introduce you to philanthropic leaders, business owners, architects, artists and inspiring locals who are living their dreams and making an impact on our region. Some have been on our radar for months; others came to our attention more recently through local recommendations. We are pleased to feature Philip Kaufman, a well-known film director who was recently given a Lifetime Achievement Award at the Olympia Film Festival’s Gala, celebrating 50 years of contribution to the silver screen. And while we are on the topic of entertainment, be sure and check out our community events calendar for our featured entertainment picks to help you plan for the coming season. A good friend of mine generously recommended the next profile featuring a Goodwill donor and DreamMaker, Willie Stewart. We were impressed by the good-work, no pun intended, that Goodwill does enabling citizens to reach their work/life aspirations. No training required. Some banks make you sit up and beg to get their best checking interest rate. Not Commencement Bank. Our powerful, new Serious Rewards Checking account pays you 2.00% interest on balances up to $10,000 — guaranteed through December 31, 2015. Simply open your account online, and then make a minimum of 10 transactions of any type each month, including debit card purchases, deposits, checks and automatic payments. You will automatically be enrolled in online banking, receive e-Statements and get a Visa® debit card. You will also be eligible for other online banking features including bill pay, text alerts and mobile banking. We’re serious about making your money work for you. And you won’t need to roll over, play dead or jump through hoops. Speaking of aspirations, we are thrilled to introduce you to a gentleman who has been a pioneer in our region for design and architecture for over 40 years. His impact on our community has been far reaching by way of his two parallel and complementary professions: teaching and architecture. It would not be the holiday season without our annual Gift Guide and our picks for shopping. Keep in mind, one of our favorite things this season is the idea of giving the gift of your time to impact our community. Will you choose a non-profit, civil group or neighbor to assist during the giving season? The gift of giving of oneself, is in itself, a pleasure. Take the chill off this winter in clothing of exceptional quality and appeal. Be warmly attired and warmly received as well. You’re covered. In style. At your favorite Simon Mall. Copyright ÂŠ 2012 ShowCase Media. All rights reserved. Editorial content and photography is welcomed for publication consideration. Twin Lakes Golf and Country Club has emerged as the premier wedding facility of South King County. oin us as we transform the chilly twilight of winter into the brilliant warmth of Christmas with this radiant musical celebration. Embracing both old and new, the performance includes carols by the great masters as well as the traditional Christmas carols we all cherish. This concert will delight audience members of all ages and makes a memorable tradition for friends and family to share. community events | zoobilee The 22nd annual Zoobilee brought in a fresh new format titled “Next Wave“ for the 2012 fundraiser. The theme represented the “water motif” and centered around Fred, the featured fish, a Wrasse—a group that constitutes one of the largest and most diverse families of fish. The Next Wave exceeded the previous year’s net revenue by 200%. Most importantly, Zoobilee was able to share the work that Point Defiance Zoo & Aquarium does in the Puget Sound and around the world. The much needed research and conservation efforts, led by Aquarium staff, help to establish ecological harmony, inform a global network of researchers, and benefit our community through beauty and recreation. Manhattan Transferâ&#x20AC;&#x2122;s 40th Anniversary performance at the Washington Center for Performing Arts began the performance season bringing 575 attendees in support of this community gem. Attendees noshed on hors dâ&#x20AC;&#x2122;oeuvres, local wines and beers and took in a special program acknowledging the Artistic Partners who provide community programs through the Center. During the event, The Center auctioned off a Dale Chihuly original hand-blown glass basket, generously donated by Susan and Scott Ritter, which was purchased by Olympia businesswoman and arts champion Renee Ries. Funds raised during this event benefit the Washington Center Arts Education Fund, providing access to programs that further arts education in our community. photo by andrea price, courtesy of ©lucasfilm ltd. & tm. all rights reserved. HEART DISEASE IS STILL THE NO. 1 KILLER. BE THE DIFFERENCE BETWEEN LIFE AND DEATH. Make it your mission to “Go Red” with us in 2013 Wear Red Day•Feb 1 Go Red Luncheon•Apr 24 piercecountygoesred.org c2012, American Heart Association. Also known as the Heart Fund. TM Go Red trademark of AHA, Red Dress trademark of DHHS. Over 20 years’ experience and trend setting styles for today’s looks. Mention this ad for $10 off a service. New clients only. community events | sand in the city Sand in the City Gala participants had the first opportunity to visit the much anticipated new Hands on Childrenâ&#x20AC;&#x2122;s Museum in Olympia. This event marked the last major function for the organization before closing the old museum and moving to the new state of the art facility. Community focused attendees bid on auction items, dined on savory food and grooved to the featured bands: LOTT Troubadors, The Torres, & The Beatniks! There were also two live animal appearances from Charlie the Alpaca and Zion the Llama. Sand in the City, as a whole, raised over $135,000 in proceeds to benefit the free & reduced programs at the Hands On Childrenâ&#x20AC;&#x2122;s Museum, making the museum accessible to as many children as possible in our community. A Jewel of the Sound – from farm to table, Olympia Farmers Market feeds our community. OPEN WEE KENDS TH ROUGH December 19 th LAST MINU TE SHOPP ER’S DELIGHT December 22 , 23, 24th! Maxwell’s Speakeasy + Lounge 454 St Helens Ave, Tacoma 253.683.4115 maxwells-tacoma.com On a Friday evening at Maxwell’s Speakeasy + Lounge in downtown Tacoma, live jazz blends with conversations and aromas that drift through the softly lit room. Overhead, crystal beads cascade from a chandelier. A waiter presents the day’s fresh catch. A steak sizzles. Bourbon whipped cream slides over warm cinnamon roll bread pudding. The bartender creates a masterpiece. needed those skills at 13, when his father suffered a serious industrial accident. Anderson received his culinary arts education in the Navy: “I worked my way up through the ranks and ran the world’s largest submarine squadron, preparing 10,000 meals a day with 132 culinary specialists working under me. Whether you choose the famous wagyu beef Walker Burger, filet mignon, apple-smoked pork chop, or half chicken with orange coriander beurre blanc, expect the best. Anderson learned early what the combination of love and good food can mean. “I asked to go live with my dad and be his caretaker,” Anderson said. “Honestly, the best waiters, the best chefs, are all great caretakers.” The teen also shopped, cooked, attended school and worked in his uncle’s bakery. For architect Thomas Bosworth, natural light is the most important building material, providing shape and meaning to everything he designs. His architectural design work, which totals nearly 90 projects, combines light and a highly specific sense of place with classical ideas of order, simplicity and beauty. Eero Saarinen and Associates while also teaching part time at Yale. His growing reputation led to an offer to become a full professor and chair of the Department of Architecture at the University of Washington, where he remained for 30 years (now emeritus). 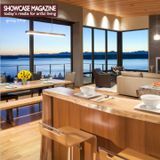 He is a partner at Bosworth Hoedemaker, a Seattle firm that specializes in custom design Recently, the renowned architect has and renovation of high-end residences been awarded the 2012 Medal of Honor primarily in the Pacific Northwest. by the American Institute of Architects Northwest and Pacific Region based in Bosworth’s portfolio illustrates and celOlympia. The honor recognizes an indi- ebrates design themes that are pillars of vidual who has consistently demonstrat- his practice and central to what defines ed excellence in design, the practice of Northwest architecture: the incorporaarchitecture, architectural education or tion of natural light throughout interior service to the profession, and who has spaces, the relationship of a building to made notable contributions unique to the landscape, a traditional vernacular the region. and the importance of craft. FAIA, writes, “Practicing architecture in the Northwest necessitates an understanding of elusive light, and projects like Ragen House on San Juan Island illustrate Tom’s masterful skills. Light streams through, rendering the interior with a light quality reminiscent of paintings by Jan Vermeer.” Over the past four decades, Thomas Bosworth has helped shape architecture—both as a profession and an art form—and architects in the Northwest. His contributions to architecture are experienced through his two parallel and complementary professions: architect and professor. 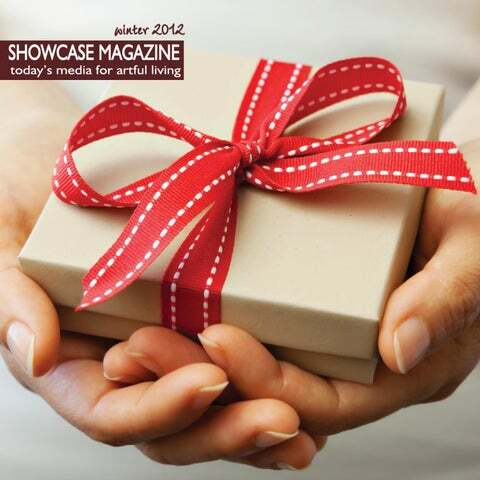 Whether you are selecting a gift for your family, friend or colleague the ShowCase staff has searched all over town for the best gifts this holiday season. hubbub for the holidays—chic shopping found Avoid all the hullabaloo and make shopping fun at HUBBUB this holiday season. Since 2005, shoppers have delighted in HUBBUB’s one-of-a-kind jewelry, purses, clothing, hats and shoes, plus home furnishings and gifts that range from sophisticated to whimsical. This bright, spacious retail store is located in a uniquely restored 100-year-old building on the northern edge of Centralia’s downtown historic district. Owner Rebecca Staebler has a passion for reclaiming things that otherwise might be discarded. She spent nine months restoring the 100-year-old building to create HUBBUB and fill it with handcrafted art. The remodel became a perfect backdrop for the contempo- If you are looking for unique gifts, high-quality handmade items and fun wearable art (ranging from $4 to $400), HUBrary, functional art that now fills the space. BUB offers a shopping experience that is not mass-produced, “I fell in love with American handcraft—things made by hand commercialized or hectic. TAMMY ROBACKER and things we use. I love to shop, I love color. When I moved back to Centralia I thought there was a need for a fun place to shop and buy art,” said Staebler. WELCOME TO CLARE BRIDGE OF OLYMPIA, where compassion and integrity meet and our community is truly a home. the sash program—helping seniors from start to sold! Companies are often born out of a demonstrated need for a product or service. That is exactly how The SASH Program commenced.